86, De Pere, passed away peacefully, surrounded by his loving wife and children on St. Patrick’s Day, March 17, 2019. He was born June 30, 1932 in Rockford, IL. to the late Daniel and Kathryn (Malone) Ritter. Dan received his Bachelor’s Degree from DePauw University, then his Masters from University of Madrid. Dan joined the USAFR, and proudly served over 30 years. While serving for the US State Department at the embassy in Bolivia, he met and married the love of his life Martha Moreno in Santa Cruz, Bolivia on October 12, 1964. A Fulbright Scholar, Dan earned his PhD. in Ibero-American Studies at University of New Mexico, Albuquerque. In 1969 the family moved to De Pere, where Dan took a teaching position with St. Norbert College. He then went on to teach with the Green Bay Public School System, retiring in 1990, to continue his work with the USAF in Military Intelligence. 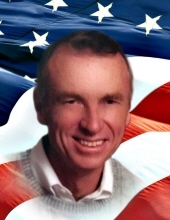 Daniel was very community minded, and had served on the West De Pere School Board, as well as an Alderman in De Pere, and was also appointed by Gov. Tommy Thompson to the Accounting and Review Board. He enjoyed skiing, tennis, golfing, and puttering in his yard. Dan also enjoyed winters in Florida. Where he also taught history classes at the Community College in Niceville. But it was the time spent with family, that he looked forward to the most. Dan is survived by his wife of 54 years, Martha, their children; Katherine (Steven) Gottfried, Jennifer (Nicholas) Schmitt, Daniel J. Ritter, and his grandchildren; Colin, Kate, Jackson, Makayla, and Andres. Friends may call at Our Lady of Lourdes Catholic Church, 1305 Lourdes Ave, De Pere after 9:00AM Saturday March 23, 2019 until the Mass of Christian Burial at 10:00AM with Fr. Benny Jacob O.Praem. officiating. Burial will take place in Union Grove Veteran’s Cemetery. Military rites will follow Mass. Ryan Funeral Home; De Pere is assisting the family. Please go to www.ryanfh.com to send online condolences to the family. The Family would like to thank Dr. David Spika, Home Instead and Heartland hospice for the wonderful care that Dan received. To send flowers or a remembrance gift to the family of Daniel J. Ritter, please visit our Tribute Store. "Email Address" would like to share the life celebration of Daniel J. Ritter. Click on the "link" to go to share a favorite memory or leave a condolence message for the family.